“I’m not an art critic or expert; I just have a passion for this kind of art and the talented people that create it. Many, but not all, are living on the margins of society – they may have experienced social disadvantage or exclusion as a result of issues such as mental health, homelessness, learning disabilities or have ended up in the prison system perhaps”. 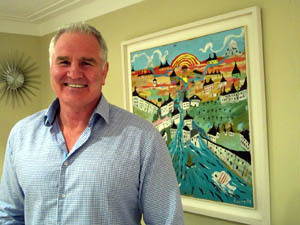 Brent says that, internationally Outsider Art has become a celebrated part of the established art world including in his native New Zealand yet he feels that not much attention has been paid to Outsider Art in Ireland. As a regular traveller to Outsider Art Fairs abroad, he is often asked about Irish Outsider Art. This has prompted Brent to set himself the challenge of going in search of Ireland’s Outsider Artists. He not only wants to shine a light on their talent but he also wants to organise a major Exhibition showcasing some of what he has discovered. In this observational documentary, we follow Brent’s journey as he travels the length and breadth of the country to meet some of the artists who submitted work in response to his national call-out. He explores the inspiration behind their work and is visibly moved by the life stories they share with him. Contributions from the national and international art world are also included. Brent’s endeavours to organise the Exhibition, the first ever Irish Group Exhibition of its kind in Ireland is woven through the artists stories, resulting in a very moving climax to this inspirational documentary film. Broadcast on RTÉ One Arts in October 2015.